The Yoruba people had their own form of religion before the advent of Christianity and Islam, they believed in their own deities, which changed with each geographical location. This religion and belief system has spread throughout the world. The Yoruba people take their culture seriously; greetings form an important part of daily life. While greetings are exchanged, it is important for the people to smile; and when asked about the wellbeing of someone, time is given to respond as this is considered to be polite. The Yorubas greet their elders with a lot of respect, the boys prostrate to greet their elders, while their female counterparts greet by kneeling on one or two knees depending on the tribe. They also have a very rich cultural background; there are different forms of dance, arts, music, dressing and philosophy. Proverbs and adages form an important part of everyday language, and are used extensively in all forms of communication. Music is also very important, and can be used as a form of communication. The talking drum is often as a means of communicating in old times and is still used presently. The Yoruba people occupy the states Lagos, Ondo, Oyo, Ogun, Osun, Ekiti, and some parts of Kwara and Edo states respectively. They have a general language called “Yoruba” which is the form that is taught in schools in the South-Western zone of Nigeria. Some of the most prominent works of the Yoruba people are in the field of art, where the works that came out of there compete favourably with that of Ancient Greece and Rome. The brilliant terracotta and bronze designs, most of these works date back to the Eleventh century AD. Regardless of their origin, the Yoruba people of Nigeria have proved themselves to be a people of a dynamic culture and tradition. The original religions of Africa have been declining over the past century due to the influences of colonialism, Western acculturation and proselytizing by Christianity and Islam. However, in the Americas and Caribbean, syncretistic religions involving African religions are growing rapidly. The Yoruba belief in one creator, Olodumare, they believe the Orisha (Orisa) to be messengers for the creator and they believe that we are born with a predetermined path which we can follow with the help of divination. The Yoruba have a very complex system of divination known as Ifa. There are 256 letters(Odu) which have verses attached to them to explain each combination and act as a guide on how to become balanced in relation to one’s path. Until the last decades of the 18th Century, Cuba was a relatively underdeveloped island with an economy based mainly on cattle raising and tobacco farms. The intensive cultivation of sugar that began at the turn of the nineteenth century transformed Cuba into a plantation society, and the demand for African “slaves”, who had been introduced into Cuba from Spain at the beginning of the 16th century, increased dramatically. The slave trade with the West African coast exploded, and it is estimated that almost 400,000 Africans were brought to Cuba during the years 1835-1864. [That’s roughly 1150 per month for 29 years!] In 1841, African slaves made up over 40% of the total population. The late flourishing of the Cuban sugar industry and the persistence of the slave trade into the 1860s are two important reasons for the remarkable density and variety of African cultural elements in Cuba. Famous Cuban Ethnomusicologist and historian Fernando Ortiz counted the presence of over one hundred different African ethnic groups in 19th century Cuba, and estimated that by the end of that century fourteen distinct “nations” had preserved their identity in the mutual aid associations and social clubs known as cabildos, societies of free and enslaved blacks from the same African “nation,” which later included their Cuban-born descendants. Soon after Emancipation in 1886, cabildos were required to adopt the name of a Catholic patron saint, to register with local church authorities and when dissolved, to transfer their property to the Catholic Church. But it was the same Cabildos the preserved the African Traditions. Although they were officially disbanded at the end of the 19th century, many were kept up on an informal basis, and were known popularly by their old African names. Some survive to this day. The cabildos not only preserved specific African practices, their members also creatively reunited and resynthesized many regional African traditions. Forged in the cabildos and amidst the gruelling labour at the sugar mills, four major Afro-Cuban divisions (Lucumí, Arará, Abakuá, Kongo) are represented in Cuba. Many Yoruba were taken to Cuba very late in the slave trade, especially during the years 1820-1840, when they formed a majority of [Africans] sent across the Atlantic from the ports of the Bight of Benin. The included several Yoruba-speaking subgroups, including the Ketu, Ijesha, Egbado, Oyo, Nago and others. In Cuba, Yoruba speakers became known by the collective term Lucumí, after a Yoruba phrase, oloku mi, meaning my friend. As a result of slavery, the lineages and kin groups that had supported worship of the various orisha were disrupted. A new religion called santería arose, which grouped together many orisha, each of which became identified with a Catholic saint on whose day festivals would be held. From the ethnically-based cabildos of colonial Cuba, santería became organized into individual “houses,” known as casas de ocha. It has since spread far beyond its original ethnic base, both within and outside of Cuba. Modern practises within Santeria also reflect not only religious but cultural Yoruba practise. The idea of family and lineage remains important, and practitioners are connected to their elders via initiation. Ones family in Ocha becomes as important as blood line family and it is customary to prostate to your elders. The crowning Orisha of an initiate is determined not by family line or geography as it is in Africa but by divination which is how in effect this ancient religion has adapted and flourished beyond Africa, Cuba and Brasil. It was necessary for the religion to adapt and even the meaning attributed to certain Orisha changed slightly. Yemoja a river deity became Yemaya the Orisha associated with the sea; although she was always the great mother. Oya also a river deity was assigned to becoming the Guardian of the Cemetery Gates amongst other things. Despite slight changes, Orisha continue to mediate between God and Human Kind; There is only one God and Odu remains the same in Ifa Practise. Fundamental to Orisha worship is a reverence for ancestor and ancestor worship. Ache or Ase is a term meaning life-force; Universal breath, the power to make things happen. This is also important to both traditions. 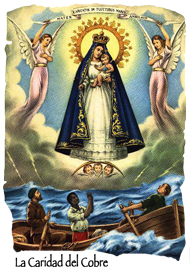 Worship to Yoruban deities took place behind the guise of Catholic Saints, hence the term “Santeria” The Caridad del Cobre is Cuba’s patron Saint and is associated with Ochun. Batá drums accompany the performances of the London Lucumi Choir and have been chosen to accompany the piece written by Juwon for the choir. Batá drums were introduced or developed in Yoruba land between 500 and 800 years ago. . It is commonly accepted that Şango the 4th Olofin of Oyo commissioned the first set of Batá. (Shango has since been revered as one of the pantheon’s most important Orishas) In Cuba the Batá drums are of fundamental importance in ritual, and calling down the Orisha. In special ceremonies, the Orisha are invited to come down and possess the initiates in order to pass along good advice to devotees. Each Orisha has their songs and even particular rhythms. Three drums is considered in Cuba as being a full set whereas in Nigeria there are 3,4,5, 5,6 and even 7. The common names for each of the drums also tend to vary according to region. In the west, the accepted names for the drums are Iya Ilu, Itotele and Okokonkolo respectfully from largest to smallest.. In Nigeria and Benin only the mother drum, “Iya Ilu” retains the same name. The difference between Fundamento drums and Aberikula: The drums used in ceremonies are sacred drums; they are drums that contain Aña , the Orisha of the drum; the Orisha that makes the drum speak. Fundamento drums are consecrated drums. They also have a legacy; one drum is born from another and has to be consecrated by a Priest. Only children of Aña,( Omo Aña) that have been through a special ceremony, are permitted to play the fundamento drum. These drums are played only in a ceremonial context; It is Taboo for a woman to play these drums. Aberikula drums are normal drums that have not been consecrated and do not contain Aña, They can be played by anybody. It has been over the last 50 years that these sacred rhythms have been taken out of context and played as part of performance. Needless to say the Lucumi Choir’s drums are not sacred, however when played well, the rhythms still evoke deep emotion amongst those who listen. For more information about the first Fundamento in the UK. The Orishas are intermediaries between human beings and Olofi ( God). Elegua is the Orisha that begins and closes very ceremony; he is the child deity, the trickster and is placated first before any other Orisha is worshipped. His colours are Black and Redor White and Black and his sacred number is 3 ; the crossroads is one of his sacred places, and he clears the pathways with a Garabato (crooked stick). He likes sweets and Rum and tobacco. Sequence for Afrekete and to Yemaya: Afrekete is the Arara (from Dahomey) equivalent to Yemaya the Mother of the great waters, Mother of fishes, the Mother of us all. Her colours are Blue and white and her sacred number is 7. Offerings include watermelon and Molasses. Sequences for Oya: Oya is Chango’s favourite wife. She guards the gates of the cemetery but is also the Orisha of the market place. She is a powerful Orisha and associated with wind and tornados. She is a warrior and goes into battle with Chango on occasion. Her favourite colour is burgundy and her number is 9. She is fond of the Aubergine. Sequences for Ochun: is the youngest Orisha and associated with the fresh waters of the River. She is the Venus of the Yoruba Pantheon and also associated with the creative arts. She loves Gold and Yellow, honey colours. Her sacred number is 5. She is sweet as can be but can be dangerous when offended. She loves Honey and is partial to a glass of Beer.